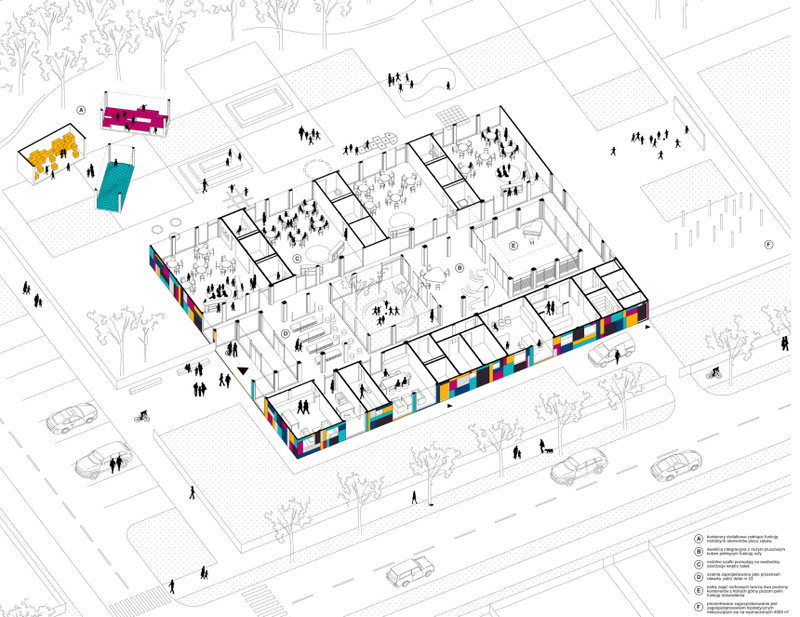 Kindergarten from the containers in our proposal represents the most optimal solution for objects with this kind of funcion. Compact form is based on a simple functional layout, consisting of three main zones. This division allows for collision-free expansion along the axis of the object. The whole is designed so that adding more rooms is possible in a easy way. 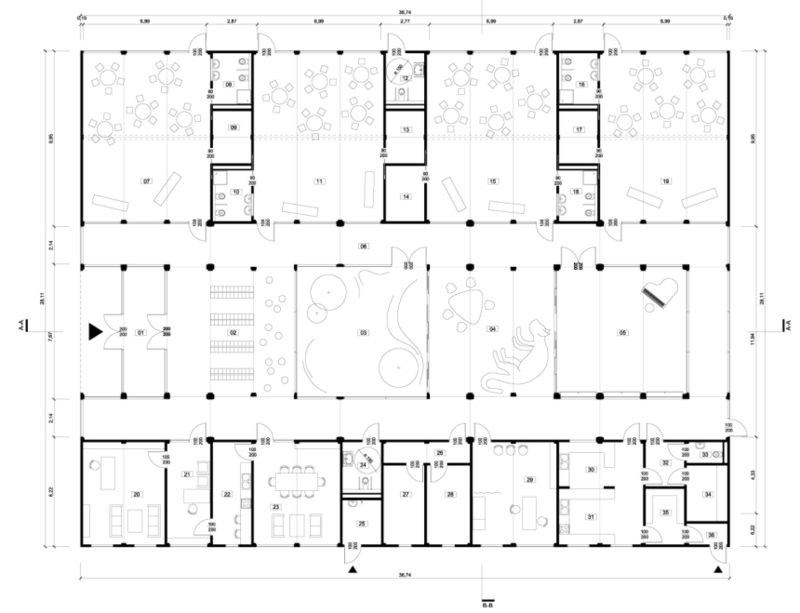 The main zone is for class rooms for kids. Each room is made of 6 containers, has an area of ​​approx. 68m2. Individual rooms have a separate bathroom with a window into the room, ensuring safe use and control of educators. Rooms have glass over the entire width on both outside and inside wall. Kids can go out directly from the room to the garden. 28 meters of the building widh, was the reason to vary the hight of the building. Central zone is a special place, with double-high space there is a place for special functions. Several additional options for transforming the central zone has been introduced as well – depending to the needs, financial capabilities, the size of the plot or the environment. 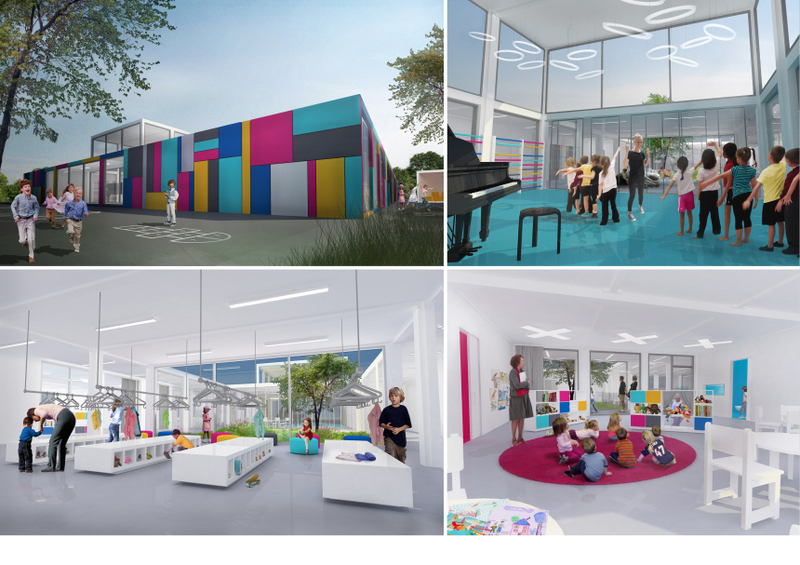 The secondary part of the proposed kindegarten is for support – small office, room for teachers, hygienist room, kitchen, sanitary facilities and a storage. A simple layout form is contrasted with colored panels on the facade. The inspiration for this solution is a landscape of a sea ports with transport containers. Colorful mosaic makes kindergarten look more cheerful, even though it is made out of transport containers. The façade is finished with cladding fiber–cement panels in 6 selected colors. Total floor area. 929.55 m2.